On Saturday I did it. 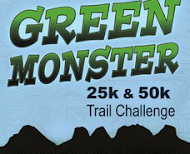 I proved you can run a 50K trail race on just one training run per week. In the process I also proved why you probably shouldn't. 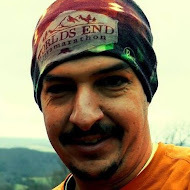 A new kid on the block only a year ago, The World's End Ultramarathon 50k/100k returned for 2016 as a superstar. The race sold out and did so quickly. The start/finish line, swag, and post-race party all got upgrades, while out on the course records fell. 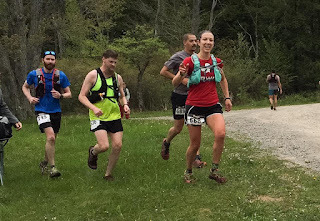 A year ago I dropped out of the 50k (race report) just before the 19 mile aid station with a sprained ankle by hitching a ride from the roadside with race photographer Tania Lezak. Having failed to finish an ultra since the 2014 Pine Creek Challenge 100k (race report) I was eager to finally "notch another 'w' in the win-column." I used to be a '7 days a week' runner. But if you've read any of my recent race ports (here) you'll know by now that I've been taking a much different approach in 2016. Lately I've been foregoing weekday runs altogether, and putting all my chips on a mountainous weekend long run or race. During the week i mostly relegate myself to the indoor bike, logging tons of low impact, high cadence, hours in the saddle. This new approach has served me well this spring at the Hyner View Trail Challenge and Chief Wetona Challenge, countering the burnout and numerous injuries I've sustained in recent years of higher mileage, higher frequency running. The big question though, would this approach be enough to carry me across 50 kilometers in the mountains? A little backstory. 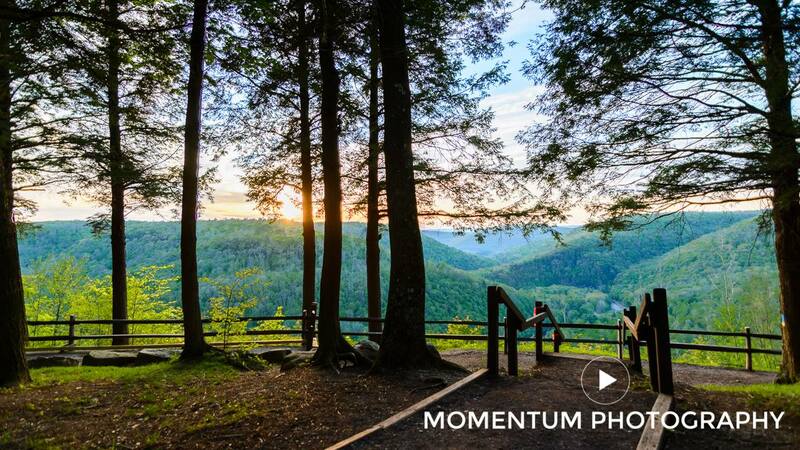 I grew up in World's End State Park. Camping, hiking, picnicking. I swam, fished and caught crayfish in the ice cold waters of the Loyalsock Creek. Needless to say, I was quite excited last year when I heard that an ultra was coming to one of my favorite places on Earth. That it should turn out to be an instant classic, drawing runners from across the USA and Canada, is an added bonus. Wake up call was a little earlier than I would have liked. A friend and fellow Penn-York Valley Running Club member needed a lift to the 5:00AM start of the 100k race. Curtis went on to successfully complete the race and caught a late night ride home with a group of volunteers from our club who manned AS10 out on the 100k course. What this meant for me was setting the alarm clock for 2:00AM instead of 4:30, and arriving at 3:45AM instead of 6:00 ahead of my own race which began promptly at 7:00AM. On Friday evening I popped two 10mg melatonin tablets and did my best to get to sleep at 6:30PM. The first few hours were restless, but with a little help from a concert DVD playing in the background (Porcupine: Anesthetize Live in Tilburg) I eventually passed out, and was sleeping soundly when the alarm startled me awake in an hour when many Friday night revelers had likely yet to go home. We reached World's End State Park just before 4:00AM and followed the path of lights, the sound of music, and the aroma of fresh brewed coffee to the start/finish to get Curtis checked in and his drop bags distributed. After, I lingered in the truck until 5:00AM, then walked back up the path to watch the parade of headlights roll out of the park at the beginning of their 62 mile adventure. They say its the small things. One of the simple pleasures of arriving way-too-early to a trail race is the joy of pooping in peace. The park's snack shop had opened up for the occasion of the race, and along with it the adjoining restrooms. I used the opportunity provided by the lull between the departure of the 100k runners and the arrival of the 50k contingent to take care of business. Its a great feeling to start a race feeling light and, empty, rather than worrying about accidentally messing your pants in the woods while struggling up a mountain side. The parking lot fell silent for the next 45 minutes or so, and while getting actual sleep sitting upright in my truck was unlikely, it at least gave me the opportunity to rest my eyes. Before long, the area came alive again as runners and their family or friends rolled in, the sun came up, and the 7:00 start time approached. At 6:30 I shed my extra layers and strolled up to the start line to mingle with the half dozen or so other Bradford County Runners. Shortly after, race director David Walker gave us 'the talk,' about bears and rattlesnakes, and sent us on our merry way. A year removed from my last attempt at the distance, and quite likely under trained - if I were smart, I probably would have been nervous. But even in the last minutes before the start of The World's End Ultramarathon 50k, the butterflies never came. Even without any recent runs exceeding 20 miles to my credit, the 50k+ is something I've tackled several times before, and standing there with the rest of 'the crazies' I just kind of figured that I as long as I kept eating, drinking, and moving forward I could drag my body to the finish - one way or another. Much like last month at Hyner (race report) I began the race with "The Beard." Josh and I rolled through the half mile or so of asphalt to the trail-head together. I passed him on first gnarly climb of the day (Butternut Trail). He shot past me on the corresponding downhill. I followed him up the second climb (High Rock Trail), and then we ran together from the top of High Rock on up the LT (Loyalsock Trail) to the ridge top. With the race's two early climbs out of the way the running gets easier for the next several miles. Josh and I ran together for a few miles more before continuing on to an impressive 7.18 finish, at which point I fell in with another Bradford County Runner, Chris, and a speedy young central Pa lady running her first 50k. The three of us made great time through the first ten miles to the aid station a Sone's Pond. Chris and I walked out of the aid station along Loyalsock road together just as another friend (Dough Lantz) came running in. After a few more miles of beautiful, open-woods running along the LT, the course finally drops down off the mountain back into the canyon. Chris left me on the downhill, and as we approached the half way point, winding along the rocky banks of the Loyalsock Creek on the "Link Trail", I began to weaken. Doug (7:16 finish), and many others, passed me in this section. Tracy Wright (7:40) and a small train of runners reeled me in from behind next, and I followed them as best as I could, up from the creek bottom, across route 154 onto the next climb. All things considered, I reached the Devil's Garden AS 15.8 in better shape than last year when the weather was hot and oppressively humid. This year it stayed cool throughout the day with occasional rain showers. That said, i was feeling apprehensive about the downhill to come, as it was where my race ended (sprained ankle) in 2015. I did make it down the mountain uninjured, but not unscathed. About half way through the descent, in a particularly steep section, I lost my grip on a rain slicked, flat topped boulder and fell onto my back (my second and final fall of the day). The runner behind me (who I would spend much of the final third of the race with) fell also. In the act of falling, I clenched my muscles, causing both of my legs to seize up. I was okay, but it took a minute of laying there and massaging myself, before I was able to stand and continue on. 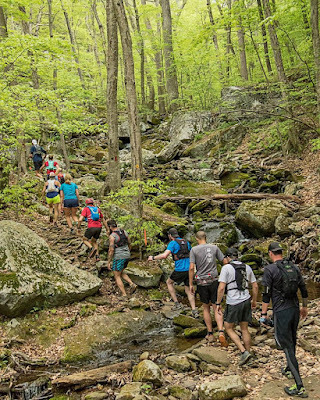 As far as I'm concerned, a World's End 50k runner's race is made or broken at the AS4 (Mile 19.3) where the course comes within eye's reach of the start finish. Whether by design or chance, its a convenient place for a struggling runner to slip off the course and drop from the race without having to inconvenience anyone by hitching a ride off of a mountain top. As has been the case in my other races and training so far this year, I generally feel that all things considered, I climbed pretty well through out the day. But the climb out of World's End is a brute. A few hundred yards up the trail I stopped, turned around for a moment, and considered turning back. Luckily I still possessed just enough shame to feel bad about it, and so I continued. It was raining steadily by the time I reached the incredible view at Canyon Vista. My mood and condition had not improved. I urinated (for the first time in the race) on the way up the climb, and it was red, which freaked me out a little bit. Was running really worth the risk of permanent damage? I sat down again at AS5 (Mile 22.2). When the awesome volunteers asked me if I needed anything I said "a bullet." A few minutes later, and completely seriously, I said "So who want's to drive me down off the mountain." The mark of a qualified, experienced aid station crew is that they don't let you acknowledge the weakness at moments like these. They fed me (fresh hot bacon, potato chips, awesome fresh berries, coke) and sent me on my way. Through the next section the amount of running that I did began to increase. I'd been alone for quite a while, and the voices of a couple of chatty ladies coming up behind me was a boost. There was a young couple running together who I played leap frog with a couple of time as well. 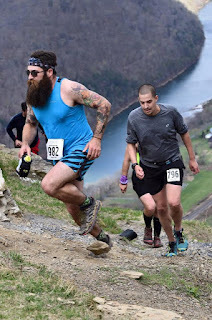 Eventually I fell in with Andy, who had run a couple of flatter 50k's, but was getting his first taste of the mountains of Central Pa, and the impressive race day hospitality / camaraderie that comes with it. 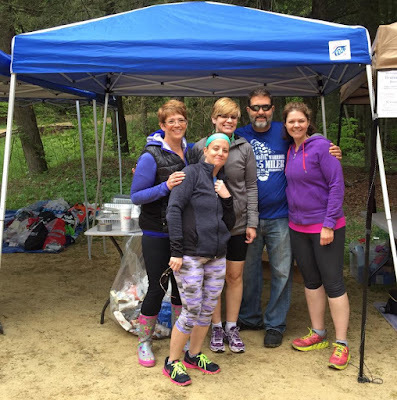 Andy and I ended up running-hiking-crawling the last several miles of the race together, including the slog into Coal Mine AS (Mile 27.7) where the Pagoda Pacers had set up an impressive spread of food and cheer. It was basically a party in the woods, that I would have liked to seen after dark when the 100k runners started rolling through. After saying goodbye to the party animals at AS6 we were left with just 3.7 miles of flat and downhill running back to the park on the canyon floor. Through this stretch, we encountered no other runners and were kind of starting to wonder where exactly we were in the field. I would have guessed that we were at the back, but as it turns out (race results) we were somewhere closer to the middle. Much of that last 3.7 mile stretch is double-track / logging road with a gradual downhill, but the final section brings the course back into the woods along a paper thin, steep diagonal downhill cut precariously into the mountain side, with the mountain to your left and a (likely) life threatening drop off to the right. The trail would be treacherous enough under any conditions, but that little bit of rain that had fallen earlier slicked things up nicely. We threaded our way back down to river level as best that we could, and reentered the park. From there it was just the simple matter of running the walkway beneath the park's iconic bridge, continuing along the parking lot, and up a couple hundred feet of trail to the pavilion where the adventure had started 8 hours and 23 minutes earlier. I finished an hour or so slower than my best 50k times from a few years ago. That being the case, I was happy to see that a few of my friends who had finished earlier were still hanging around. It feels good to have people you know see you finish. Immediately after finishing I sat down and had a beer with three new friends made out on the course, and then followed that up with some excellent gluten free Mac & Cheese and a piece of sausage, before driving home in the pouring rain. A day later, I'm feeling surprisingly good. In terms of soreness, I've certainly felt worse, though I'm taking some flack from an angry right foot that has me walking with a bit of a limp and no regrets. If you don't run this race next year, you are a fool. 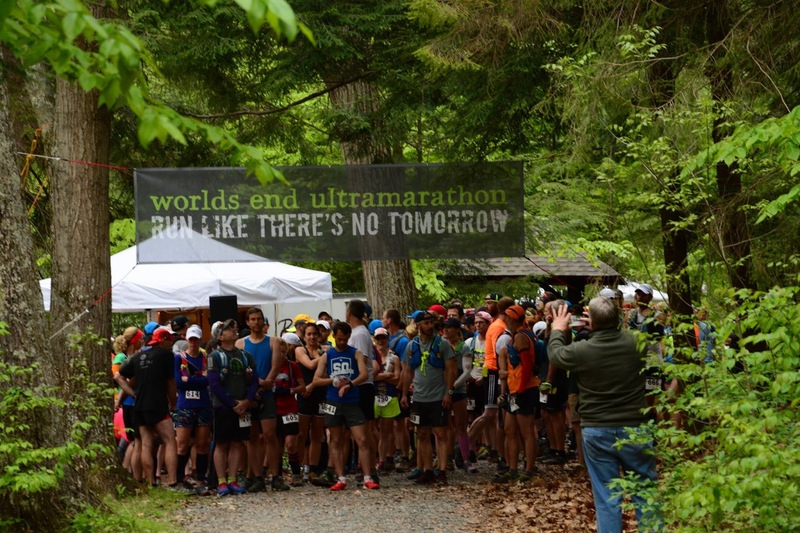 The World's End Ultramarathon will sell out quickly. Become a member of the race Facebook page HERE and await the announcement. To find out about dozens of other great PA Trail Races, join the PA TRAIL RACES FACEBOOK GROUP. Wow! Reading this was like being there with you. You are an inspiring runner and writer. I am proud to call you my friend! Thanks. Jeff Russell for Green Monster 2016? Hi Brian - I am one of the three new friends you had a beer with post-race! I stumbled randomly upon your blog because I was google searching the true elevation gain of the race. I think my Garmin got very confused! Anyway, it was really nice meeting you and I hope to see you at future PA races! My garmin died just after the final aid station. If I get around to uploading the data, all the climbing was done at that point, so I should have a fairly accurate total. Nice meeting. I'm sure we'll run into each other again.